2003 Mazda 6 headliner replacement and repair. 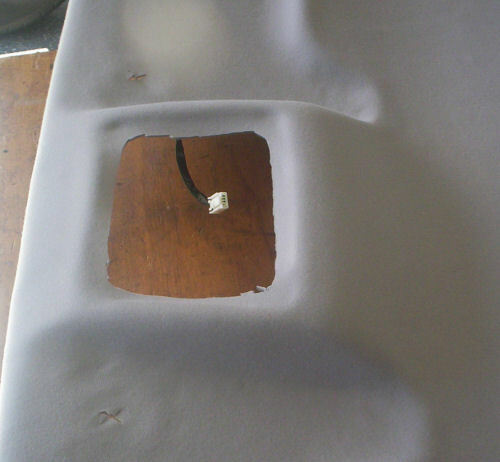 This 2003 Mazda 6 headliner was not sagging down completely, only in the back 2 corners of the car; but the owner decided to nip the problem in the bud and replace the headliner material. Below you will find the complete step by step installation instructions to replace the headliner in a Mazda 6 car. 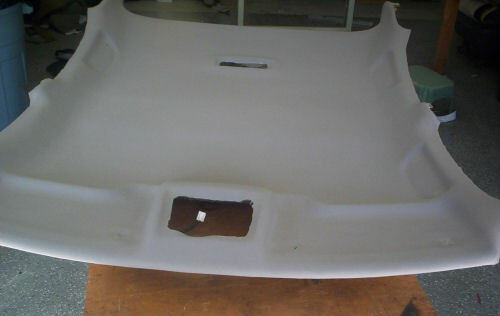 The color we used for this 2003 Mazda 6 headliner was 2173 light gray. A small to mid sized car headliner kit will work for the 2003 Mazda 6 headliner. 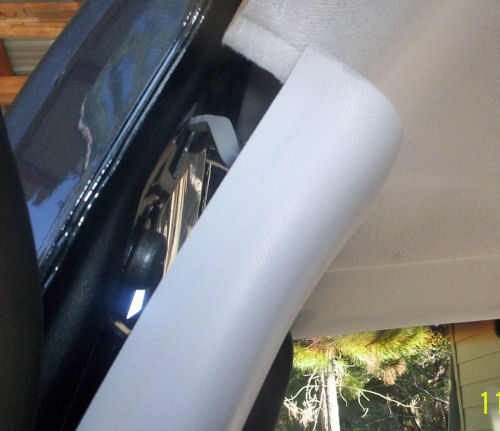 As you can see from this picture, the headliner was only coming down in the 2 rear corners and along the back of the car, but the owner decided to replace the complete headliner before the rest of it came down. There are really no good quick fixes when the headliner material starts coming down except to replace it. 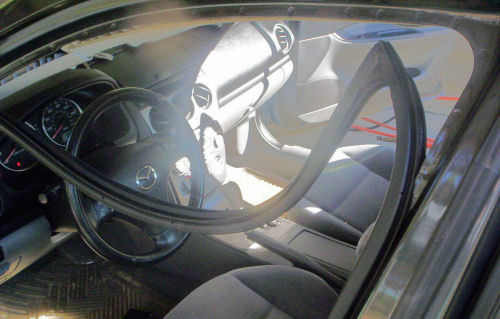 The first thing we removed from the 2003 Mazda 6 was the sunvisors, wich only had one screw - simple. The support hook was a little harder to remove - it snaps into the metal roof and can be removed by using a small screwdriver or something like it to press the fins in on both sides of the support hook. Next, we removed the grab handles that is attached through the headliner. They have a plug that can be removed with a small screwdriver (popped out). There were only 4 screws in the Mazda 6 headliner, everything else was plugged and snapped into place. 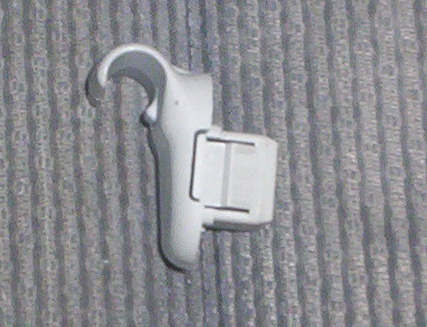 The small console (for sunglasses) in the front of the Mazda 6 only had 2 screws located under the sunglass holder. Once they were removed, the console could be taken down and unplugged from the electrical system of the car. Screws in the back, unsnaps at the other end. 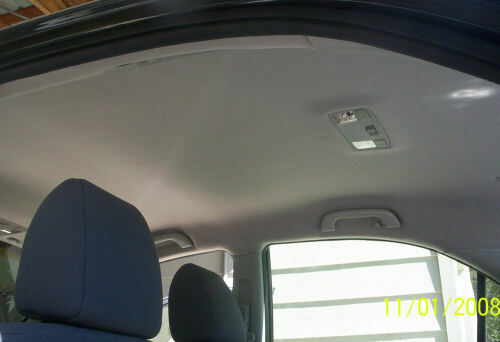 The 2003 Mazda 6 headliner color was 2173 light gray. 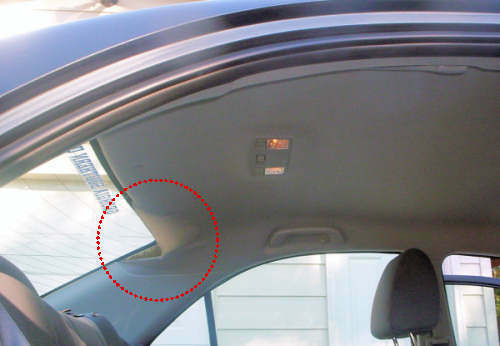 A small to mid sized car headliner kit will work for the 2003 Mazda 6 headliner. The edge of the headliner is covered with the rubber door trim. It needs to re pulled loose to get the headliner board out of the car. Only pull down what needs to come down (don't remove it completely from the door, it's unnecessary). The plastic trim on the windshield post can be popped loose so as to free the headliner board. 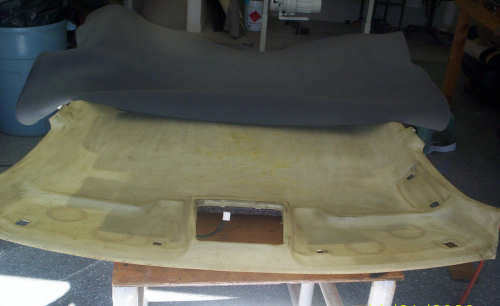 Only the top needs to be loosened, along with the center plastic trim and the rear panels. All these are made of plastic and are snapped into place. None of these have to be removed, only pulled down so the headliner board can be worked out from under them. 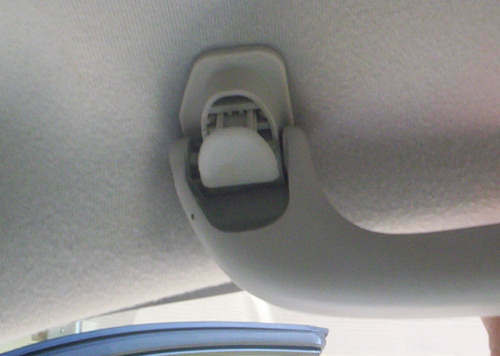 There are 3 plastic trim plugs at the rear of the headliner that hold it in place at the rear, these need to be removed. As you can see from the picture, they are relatively simple to remove. 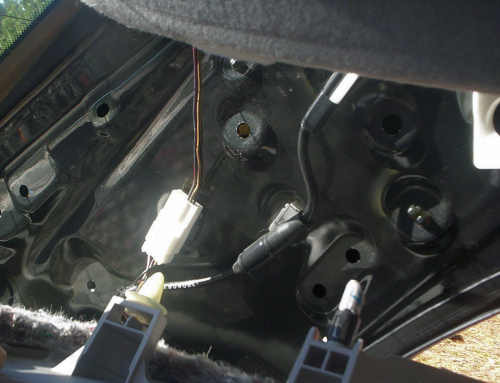 There is a wiring harness attached to the headliner board in the 2003 Mazda 6 (and other year models as well) that has to be disconneted so the headliner board will come out of the car. 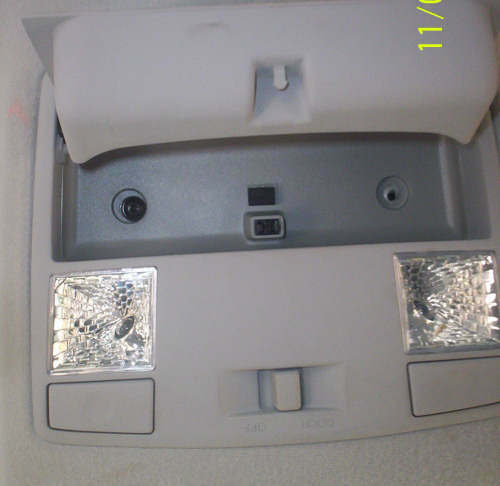 The connector plug is behind the drivers side rear panel. When you pull this panel loose, it can be disconnected. With the headliner board free from the roof of the mazda 6, you can slide it out of the car through the passenger side, front door. When the headliner board is out of the Mazda 6 car, lay it something so you can work on it. Pull the old material off the headliner board. 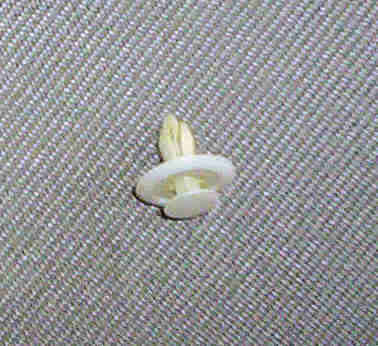 The headliner board in the 2003 Mazda 6 (other models as well) is made from fiber. It is very resilient so a wire brush can be used to clean the board. 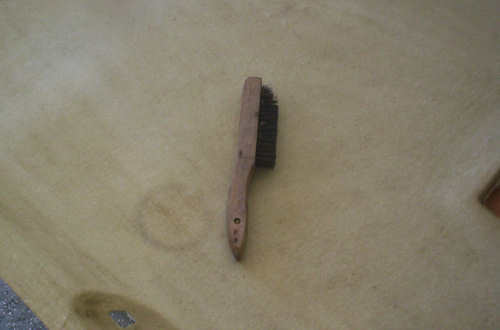 The wire brush we used was like a grill brush and does the job efficiently. 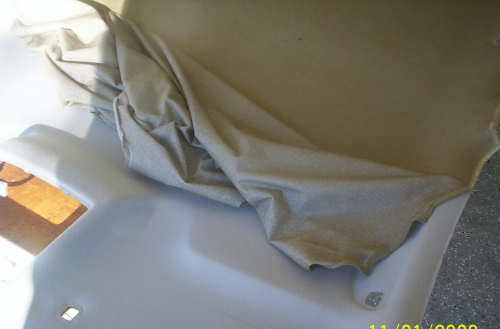 A wire brush will not damage the fiber type of headliner board. When you get the Mazda 6 headliner clean and brush off the dust, place the headliner material on the board, and fold it back (at about the center mark), it should be ready to apply. Take special care when working the cloth at the front around the console opening. The console opening in the Mazda 6 headliner board is raised approximately 3 inches - care needs to be exercised when working the headliner material around this opening. 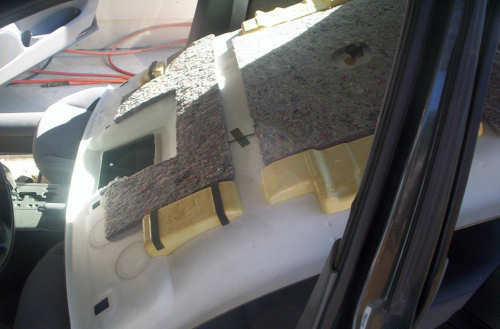 The material should be glued to the top of the console opening first and worked down the sides; pulling the slack out at the front and to the sides of the headliner board. Dry fitting it without the glue first; will help you to know what to do. This is an odd shape to work headliner material around, but it can be done easily if one will take their time. 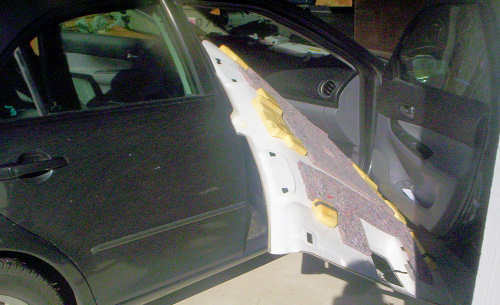 If all the steps before this went well, this is what you will end up with - a newly recovered headliner board that can be installed back into the car. Let it dry for a little bit (about 30 minutes to an hour) and put it back into the car just like it came out (same order). With the newly recovered headliner board installed, it should look like it did when it came fromt the car lot - like a new car on the inside!